Patapony is a rhythm-based game inspired by the game Patapon. Here you control an entire army of Pinkie Pies and lead them through a few different stages, using your drums to create three different combinations that tell the Pinkies what to do, namely March, Attack and Defend. While there aren't many levels, they certainly were enough to game over me once or twice, and it's really fun to play. It starts off a little hard due to unfamiliarity, but once you get the hang of it everything goes a lot smoother. Now, get out there and start drummin' so your Pinkies can follow. 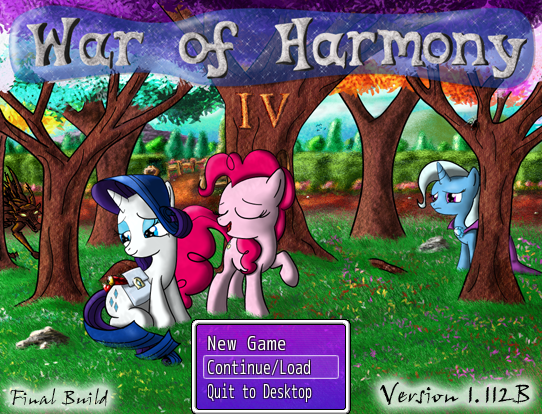 If you feel like relaxing for a few minutes and you think Applejack is best pony, this may be the game for you. It's an interactive simulator. Maybe you've seen or played games like this before, but if you haven't, it's a game where you can interact with the character, usually by petting them or scratching their ears, trying to get them to like(or dislike) you. There aren't a lot of things to do in this one, but it does have enough interactions and the animation is good enough to keep you entertained for a good five minutes. Now go! Start petting! Hey look, Apocalypse isn't the only undead blogger here. A mechanics experiment by the creator of the War of Harmony series, this game has no plot and is still a bit rough around the edges, but it's worth check out if only to give the creator some feedback. That being said, the creator is currently on hiatus. Either way, nothing to put after the break. Download's up above, creator's tumblr is here. Also hey look I'm still alive. Hi everyone. 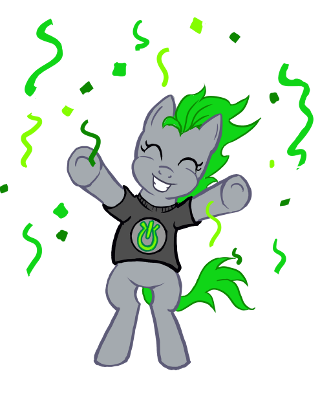 For the third time in a row, the My Little Karaoke team has released a new batch of songs for aspiring horsefamous singers to destroy their vocal cords to. If you've seen this project before, you'll know what to expect; if you haven't, it shouldn't be hard to guess. Like always, the new pack can be downloaded from the project's official site, and the listing of new tracks will be copied below the break. This game has been out for a couple of months now, but it's never too late to post about projects, I think! 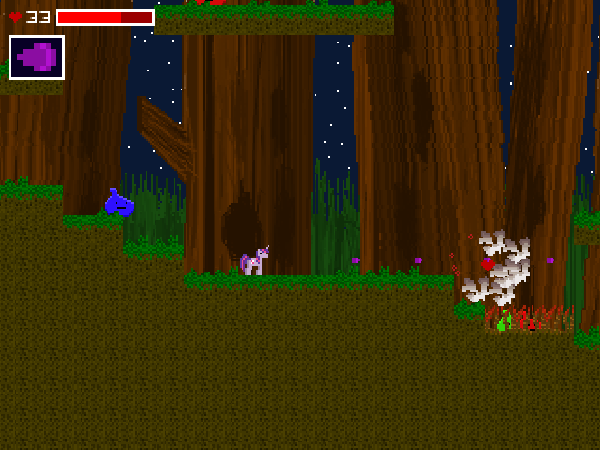 Legacy of the Pony, created by DeftFunk and Noonanna, is a non-linear Metroidvania-style platformer starring Spike as he ventures through a sprawling cave system to rescue Rarity from the Diamond Dogs. To complete their journey, players will need to locate the Elements of Harmony hidden deep in every corner of the game world.. A variety of powerups and collectibles are littered throughout the game to help Spike on his quest, and a map system helps keep players from getting lost. The game has an 8-bit aesthetic reminiscent of Game Boy games, which provides a bit of charm. The game can be downloaded from Dropbox (with a Spanish version available for some of the international readers out there), and it has its own subreddit for discussion on the game. I've barely scratched the surface of the game so far; this post may see updates in the near future with further impressions as I progress. 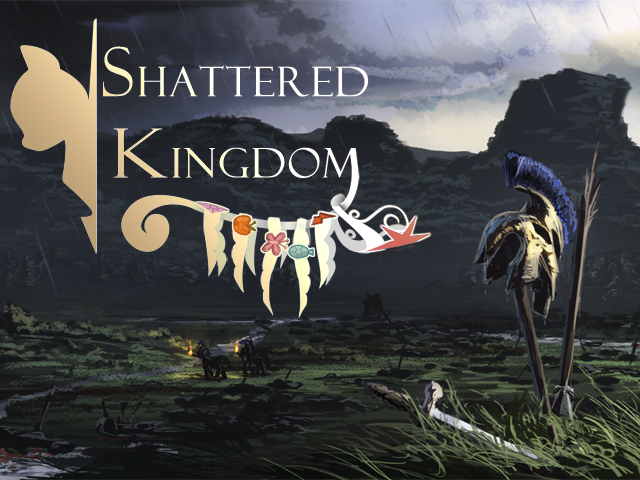 There are a lot of story-based games circling around the pony fandom, but not many have the strong player-influenced dynamic that Shattered Kingdom aims to provide. The project, being developed by a group known as Alicorn Games, is a turn-based strategy RPG centered around an Equestrian civil war between the Celestial Empire and the New Lunar Republic. The game will be heavily story-oriented and non-linear, with the player's actions influencing various story elements throughout the course of the game. The game is still early in development, and no public demo exists (at least that I can find), but a recent video of their panel at Bronycon 2014 showcases some of the team's current progress. More information can be found on the team's official blog. 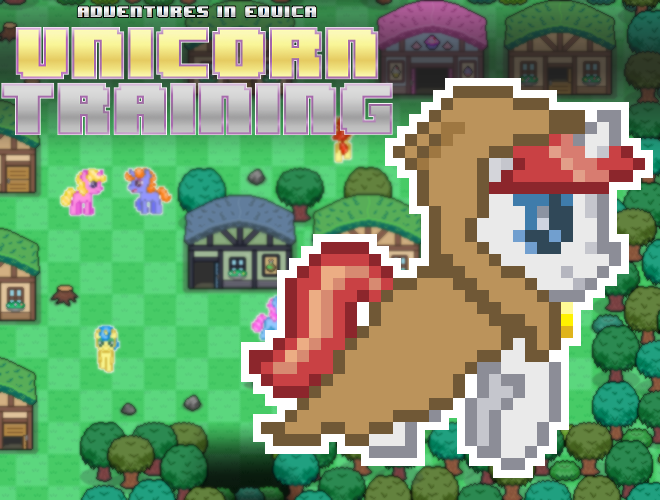 Adventures in Equica: Unicorn Training is a top-down shooter/RPG hybrid game developed by Yotes Games for mobile phones and tablets, which takes inspiration from the FiM universe but apparently manages to be distinct enough to get away with being a paid game. The game centers around a young unicorn named Clover, apprentice to Totally Not Starswirl the Bearded, as she trains in the ways of magical combat. While we posted about the project in its earlier days, when it was known as Unicorn Quest, the game finally released over the weekend for Android devices. The full version, which costs 99 cents, contains nine dungeons to explore, though only the first is available in the demo. While the game shows promise, my play session with the demo was disappointing; poor touch screen controls combined with tedious, monotonous fights and a dungeon that went on for too long to create an unsatisfying experience. Various bugs in movement and the interface served only to further dampen the fun. In addition, the boss at the end of the demo's dungeon simply vanished when I attempted to reload a save file, leaving me no other option but to exit without seeing whatever proper ending may have been there. An extra coat of polish and some more effort on dungeon design would greatly benefit this game; right now, I can't recommend much more than trying the demo out for a play session or two. Note: This game contains a few mature themes, as well as some crude gore. Are you enjoying Halloween so far? No? Let's do something about that. Octavia in The Underworld's Cello is a point-and-click adventure game made by Herooftime1000 wherein two ponies get lost in an old mansion. Within, you'll find puzzles, alchemy, and even a few card games. The content present is a lot of fun, and the game seems to take inspiration from old LucasArts point-and-clicks in every aspect of presentation. Though the game is unfinished, the current content is more than enough for a good evening of fun and jump scares, as long as you make sure to save often. The puzzles present are great fun, and the mechanics help to add a lot of depth to the gameplay, though occasionally an item seemed to vanish upon pickup with a full inventory. If you remember the game MoonLight from a few posts back, it now has its own Tumblr in case you want to follow its progress. Along with that, the creator has added a "demo" of the engine being tried out and a sample of the music that has been made so far. The engine is still in an extremely early state, but I think it gives a good feel of what the game is aiming for. This one's been sitting in the inbox for a little bit while some preparations were made for the post. Poképon, made by Silverweed91, is a Pokémon-styled battle simulator featuring various ponies and other characters from the FiM universe. The current early release is a little barebones and unstable, but battling and teambuilding over the internet are fully supported. The game takes inspiration from Pokémon Showdown in its presentation and layout, for an easy transition for anyone used to that interface. A download link is available on the game's site, and the source code is located at the game's GitHub repository. Since there's no official game server running, I've set one up on my VPS; to connect, set the IP to lyrawearspants.com and the port to its default. There may not be anyone ready to battle when you connect; in that case, simply wait around for someone to show up. Silent Ponyville: Echoed Sorrows is a game where you dive into Pinkie's mind to uncover the cause of her constant nightmares. (Or something like that. There isn't much to go off of from their site.) The team behind the game is currently looking for a few extra hands to assist with development. Though there isn't much information about the project at the present time, they already have a trailer up, and a GitHub repository of unfinished code is available on one of the developers' profile for curious eyes to look over. More information, including how to contact the team, is available either on their site or copy-pasted below the break. War of Harmony IV is an RPG created by Marshal Ruffy which has been under development for quite some time now. You may remember Tuxxy reviewing an earlier build of the game, so I'd like to begin by saying I will NOT take into account that review. I will be reviewing this as if it were an entirely new game. As always, check below the break for the review. 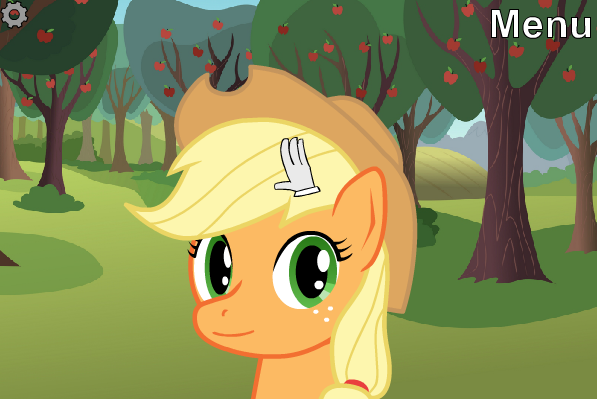 That video thumbnail may be confusing, but rest assured the topic of the video is indeed ponies. The team working on a game called MoonLight are looking for new members to help in the making of the game. Below the break I will put the details as to what they're looking for right now. The development team behind Horse Game, a 3D game about... something, will be hosting a panel at BronyCAN 2014 next weekend. The Horse Game panel begins at 3PM on Saturday, and will feature the developers as they (as described in the press release) showcase gameplay, detail the development process, and explain their goals for where this project will lead. Pre-registration for the event closes tonight at midnight, for those interested in attending. 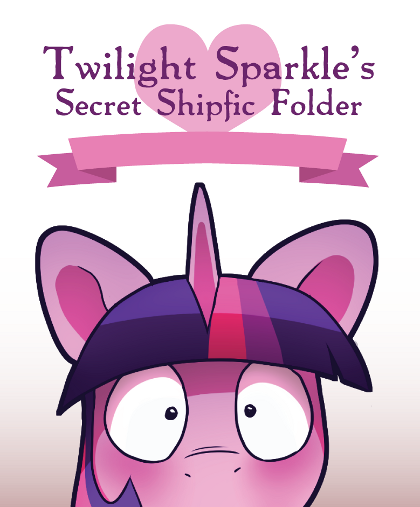 Other games present include Twilight Sparkle's Secret Shipfic Folder, which will be on sale in the dealers' hall, and Legends of Equestria. 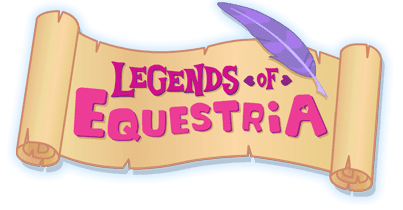 We already posted about this when the announcement was made, but Legends of Equestria, the most well known horse MMO in the fandom, is hosting an open server this weekend to live out all of your romping around and boundary-escaping fantasies in. They've now put the client up for download, and the servers will be going up soon if they aren't already. Check out their news post for more information, or read the important bits mirrored below the break (as their site servers always seem to go down often during open servers). If you have some time to kill but don't have enough energy to invest into a complex game, here's a more simple option for you. 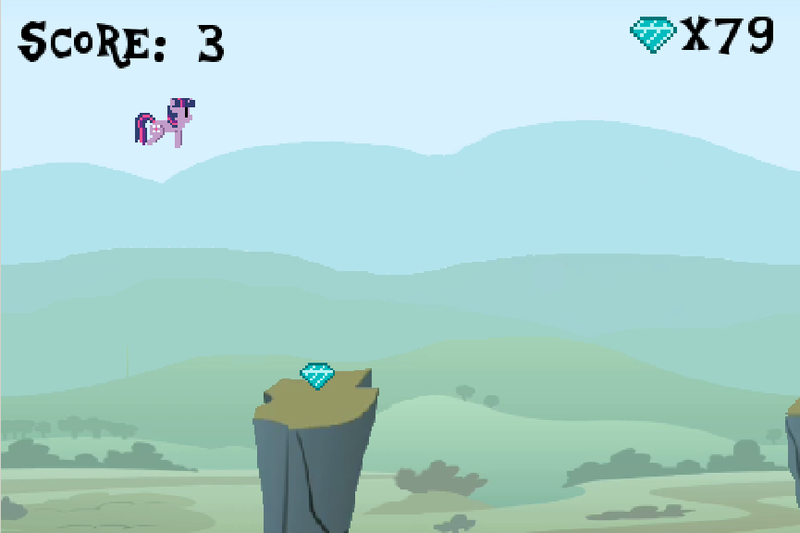 Leap from pillar to pillar while avoiding the off-screen hydra and collecting gems on the way that you can use to unlock other ponies and hats(YES HATZ) in this little game that could potentially rival Flappy Bird when it comes to addictiveness. Available for Windows, Mac, Linux, and even Android! Since it's a rather straightforward concept there's no break this time. Enjoy! 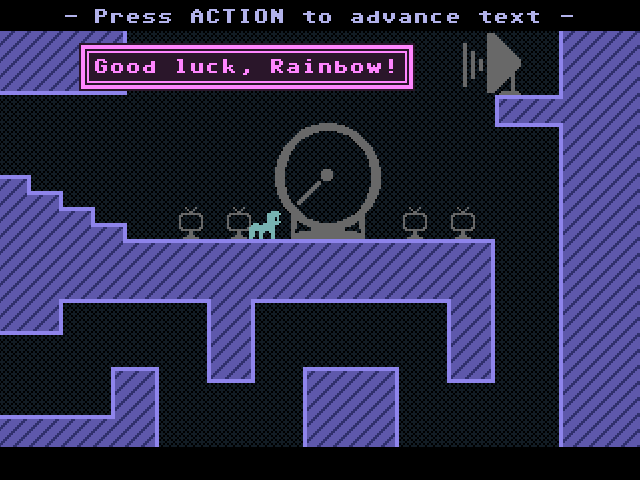 My Little Game Dev Pony Build-Up Event! For those of you who would like to improve your skills in the arts of game making, here is a good chance to do so. 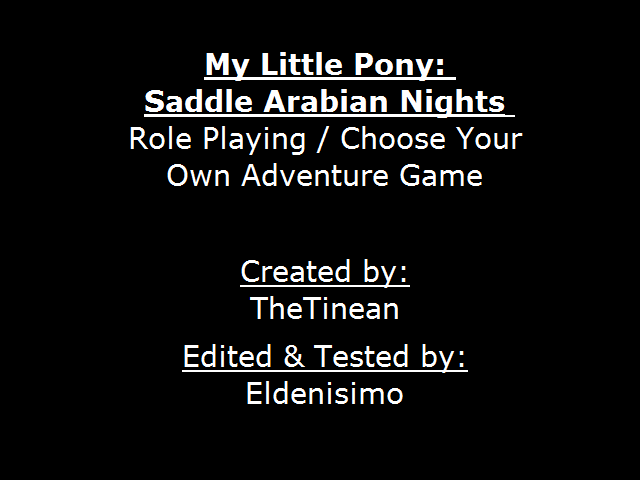 My Little Game Dev is hosting an event about creating Pony mini-games based on themes. If you want to make a game but lack the motivation or the base to do so, this is a good start. And for those who don't actually want to make games, you will still be able to play the entries, so why not take a look around? 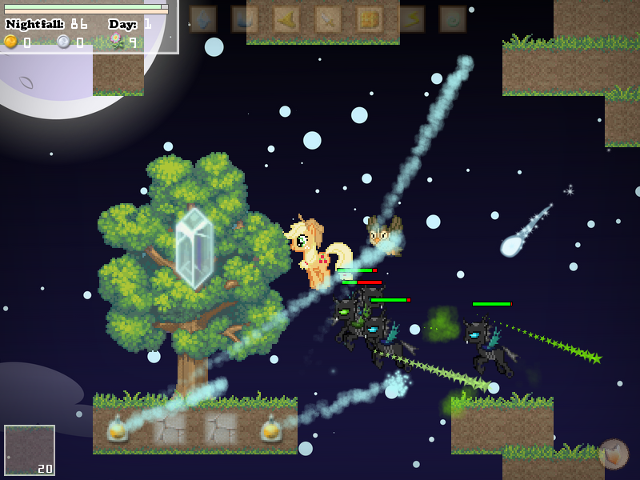 Super Pony Wars is a turn-based strategy game modeled after the Super Robot Wars (or Super Robot Taisen) games. 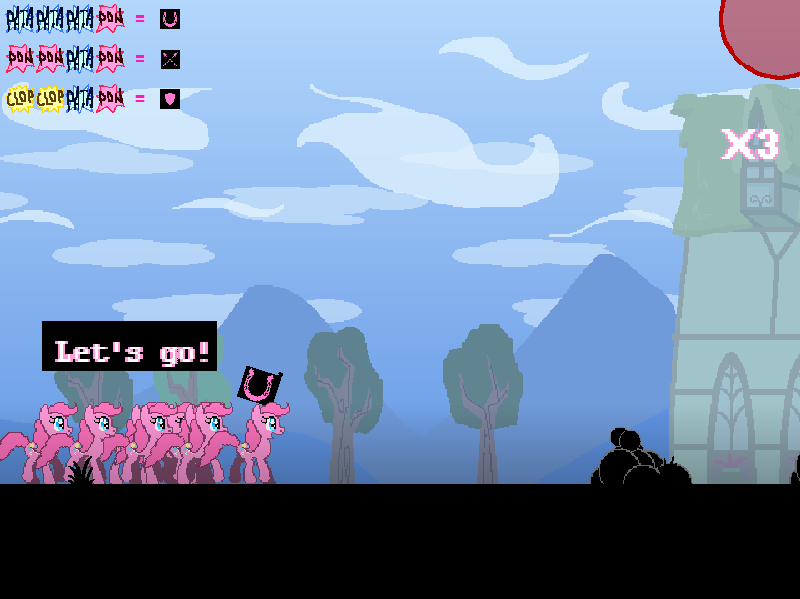 The player moves each pony around a grid-based map and chooses from a list of attacks to defeat the enemies. You can also choose to watch the neat attack animations or skip them if you'd prefer. It's currently under development and the creator of the game is looking for anyone who would like to help in the making of it. Now if that title doesn't make you want to play this game, I don't know what will. 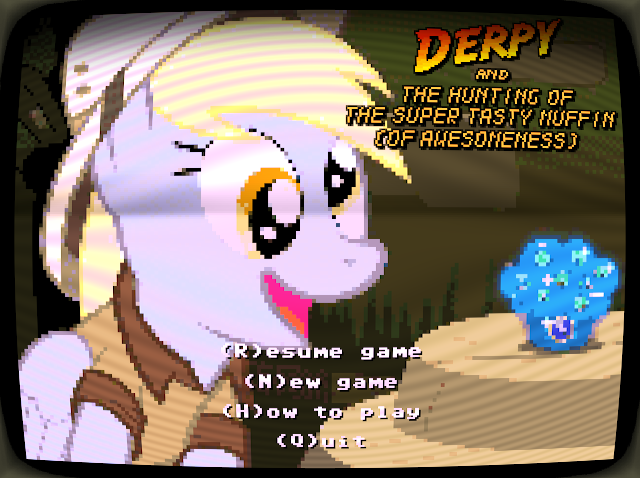 Derpy & The Hunting of the Super Tasty Muffin (of Awesomeness) is a graphic text adventure made by PonyDreamStudios that will most likely entertain you with all its open possibilities and silly situations. The game is currently in Beta, but the main story is already completed. 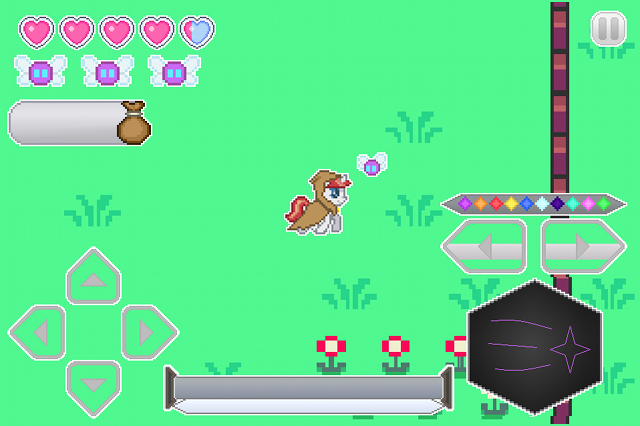 Here we have an update on the progress of MLP: Revenants of Chaos, a promising upcoming adventure platformer clearly inspired in 16-bit era classics. 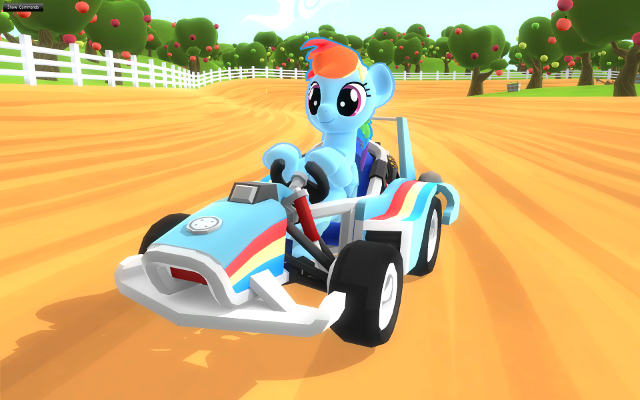 In this game we take on the role of everyone's favourite technicolor flyer, Rainbow Dash, as she runs and flies around Ponyville collecting gems and fruit and avoiding dangerous oranges. Sort of pony related, I guess? Megaman being one of my favorite series, I GOT HYPE from this one. Toasty Justice sent in the showcase trailer for Megamare X from EFNW 2014, and it's looking like the project is making good progress. "Now featuring Mech-suits, new enemies, intense platforming, vigorous challenges, and more to come!" he says? Well, count me in! Get the trailer above; if you want to follow the project, you can do so on twitter, tumblr, deviantArt, and their website. Also, apologies to Toasty Justice for being a little slow on posting. TheTinean dropped this little oddity in our mailbox: a cross between a pen-and-paper RPG and a choose-your-own-adventure book. With character customization and the quintessential dice rollin', it's a good distraction if you're aching to play a pen-and-paper RPG but don't have the friends or GM nearby to do it. Update: The response has been overwhelming so far! I'm starting to look at the applications now and will probably be sending out a few invitations to people. If you haven't received one, I might just be getting around to yours. Feel free to send one in if you haven't already; I'm still checking them. As readers and followers of this site may have noticed, new posts have been pretty slow to happen. The reason is we simply don't have enough writers with the free time to manage all of the submissions; I'm often busy, Tuxxy's expressed increasing disinterest in continuing to manage the site, and other writers have gone AWOL. To attempt to solve this, we're putting out a call for new writers to give the place some extra manpower. If you're interested in writing for what, for many, is the first stop for My Little Pony gaming and fangaming content, read below the break for more details on how to apply! 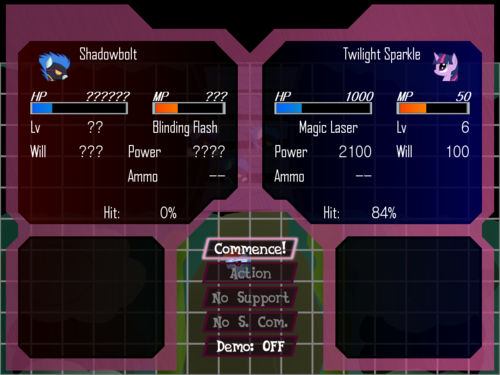 Created in 48 hours for the Crystal Games Challenge (which either nobody told us about or we lost in our email inbox somewhere), Robin Steele the Waifu Thief is a small game by Pix3M about a villainous Original Character Donut Steel™ barging into Canterlot Castle and claiming Twilight Sparkle as his waifu, whoever he has to take down to get there. Naturally, you play as the villain. Randomly generated floors and a massive difficulty help to somewhat increase the playability of this rather short game, and it's definitely worth a couple plays for the beautiful sprite work, but once you've experienced the ending, there isn't much to come back to. Since I'm guessing that most of you people have already participated in one of Legends of Equestria's many open server weekends and pretty much know what to expect, there's not much for me to say aside from that it'll begin at 12:01 AM EST on August 8th and end at 11:59 PM on the 10th, and that you will need an account on their forums in order to participate in the usual mixture of general chat, roleplay, and enterprising young chaps finding increasingly convoluted ways to leave the confines of the map. Not the sort of thing that I usually enjoy, but it's not like I really have much for friends to play LoE with, so I usually just run around as a lowly mudpony and quit shortly after reaching that one really high spot just outside the lawyer-friendly city of Cantermore. 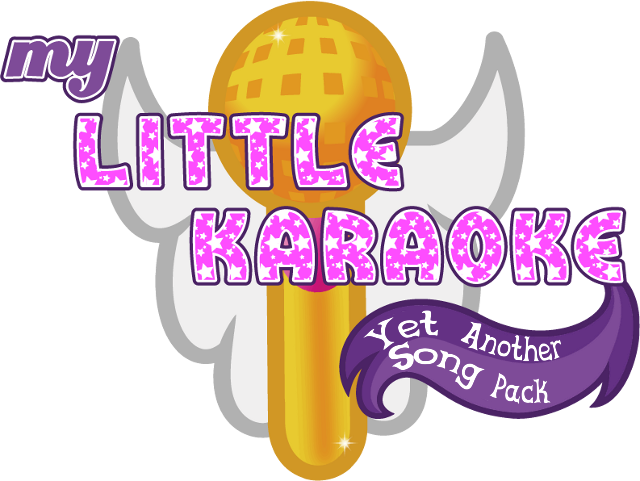 Last week, the crew behind My Little Karaoke - a song pack and modification for UltraStar for singing along with various pony songs - released a new content disc. The expansion provides a total of over 90 new songs according to the developers, including foreign language versions of a few official songs for you to improvise nonsensical lyrics over, as well as a bunch of brony music of... varying quality. (I liked a couple of them, anyway.) The update also comes with a new visual identity for the project. You can find the download here, although the individual ZIP downloads of songs are no longer available, leaving the only option to download the entire 2GB ISO (which they seem insistent on using, as opposed to other, more sane archive formats for digital downloads like this) and extract the songs you want. The prior downloads have to be installed for an automatic installation to work, although nothing's stopping you from pulling the songs themselves into a custom UltraStar installation. Read past the break for the list of new songs in this release. Well what do you know, Special Somepony (also known as Cloudsdale's infamous SSP, who has simultaneously been the most popular and infuriatingly annoying person on Romance) has recently announced that he/she is providing updates about their status for whatever reason. Not that you'd want to follow the premature dating misadventures of several twelve year old children on an internet chatsite anyhow, but apparently this is pony related so I guess you can...try to enjoy this? Only a couple days after the previous Story of the Blanks HD update comes this new video, featuring two very similar concepts for the game's visual style: the former being more zoomed-in while the latter taking a more effects-heavy approach with a more distant camera and the background being blurred out quite a bit more. I lean more towards the latter myself, although I get the impression that using varying camera distances for different scenes would actually be rather useful for story and atmosphere-related purposes, but if you want to give your own feedback then feel free to comment on their YouTube video and speak your heart out. Also, you'll be pleased to hear that the team are apparently going to continuing the original, more show-accurate style unless they happen to receive a C&D, a decision which I fullheartedly support. After over a year of almost absolute silence from the developers of the Story of the Blanks HD remake, aside from the rare animation preview and occasional snippets of the soundtrack by Kyoga, their head has come forth and confessed that she's essentially paranoid about the possibility of a C&D (nevermind that the vast majority of fangames have never received one, contrary to what your average EqD commenter might tell you) and is really wanting to move to an entirely original style with renamed characters and...ugh. It's almost as if she's forgotten that this is supposed to be a fangame, let alone a remake of a fairly well-known creepypasta, and such a project should be more a labor of love rather than merely an opportunity to make money. Heck, the reason why people were attracted to this project in the first place was because it purported to be an expanded re-imagining of the original game in the same spirit, not some cutesy Power Puff Girls-style romp that just happened to share its title with Story of the Blanks. Look, I'm sorry if this comes across as rude or anything like that, but this was honestly the one ambitious fangame I was really, really excited to play someday (aside from some quirky projects like Raycord Legends and Curse of the Lost Kingdom), and now it almost looks as if it's all going to go down the drain just because the creator is afraid to accept the necessary chance of a C&D. If you're going to enter the fangame development scene at all you have to take some risks; trying to skirt around the issue by changing names/character designs will only result in people getting upset and a smaller overall playerbase. 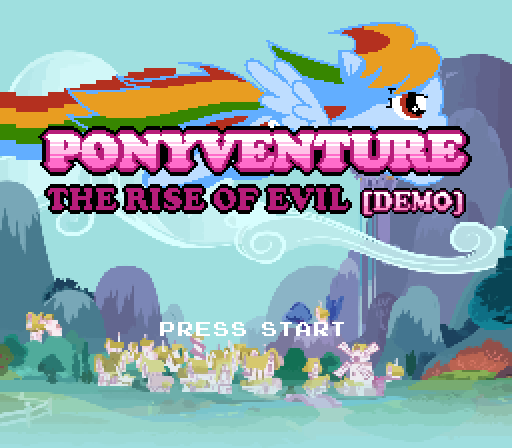 This has been sitting in our inbox for a few days undetected, but someone by the name of inderpxar modded VVVVVV to replace all of the characters with ponies. There are also a few dialog changes. There's not really much to say about a simple graphics mod, but it's an excuse to play through the game again, so I suppose it must be worth something. More information, and a download link with instructions for applying the mod, can be found in the Tumblr post. Now that The Overmare Studios has released this new Fallout: Equestria preview, I can kind of understand why their previous videos used a first-person perspective: their current pony model looks surprisingly creepy when animated, especially with those large, unblinking eyes. Come to think of it, it feels like there's something a bit off with almost all of the animations, although I can't quite lay my finger on it. Perhaps it's just because the animations are incomplete, or maybe this is actually a surreal horror game and Littlepip is an android who happens to fall into the uncanny valley. It's already scarier than Dead Space, so why stop there when you can go all the way down? They're also recruiting, and since I don't feel like pasting their ad below the break this time you can read about their requirements at http://theovermare.com/blog/2014/04/flow-of-animations. Here we have Equestria Racing, which appears to be some sort of ponified Superman 64 clone minus the beat 'em up sections and kryptonite fog. I do have some rather mixed-feelings about it so far, but hopefully the final product will manage to make for it by throwing in some interesting locations to fly around in and whatnot. I've embedded some of the previous development updates below the break as well, in case you're interested in seeing those. For various reasons, the Legends of Equestria development team decided to release a Babscon trailer showcasing the game minus the apparently quite awesome dragon invasion they held near the open server weekend's end, which I find somewhat disappointing. Ah well, at least it's a nice preview for those of you who want a sample of the LoE experience without waiting for another open server weekend or the lines of people sitting on that one rooftop and general goofiness typically found in private servers, the latter of which I wouldn't consider a downside to visiting a private server at all. And on another note, tux3 released his LoE private server build on GitHub a couple days ago, which you can grab at https://github.com/tux3/LoE-PrivateServer/releases for whenever those go live. Work on the Ponykart C++ port seems to be progressing smoothly, if at a rather slow pace, but it seems that they still have a shortage of 3D modelers (a problem seemingly shared by many FOSS games). The fandom does seem to have a distinct lack of those as well, sadly, but if you happen to have some experience with 3DS Max and/or Blender and would like to contribute to the community in some way or another, this is probably an almost perfect opportunity for you to get some practice and should look pretty good on your résumé. I wasn't told exactly where interested applicants were supposed to apply for the position, so you might as well just do so at the recruitment thread if you feel like it, which can be found at http://ponykart.org/index.php?PHPSESSID=dqbg1ss4oeajnblv8k3b5g44f0&topic=52. If you remember when Minty Fresh Adventure was released back in April over two years ago (has it really been that long? ), Mark Sprague mentioned that he was planning on releasing an expansion of sorts to the game, but it kind of got pushed out of the way in order to focus on finishing the much more ambitious Minty Fresh Adventure II by the end of the year. Of course, we all know how that went, and in order to keep us distracted from asking where his game went Mark has gone and finally tossed PPP 3 1/2 to the masses...two years late. Ah well, at least it's something. In case you're wondering how the expansion turned out, I've written a review of sorts below the break. Back in March we posted about an upcoming Legends of Equestria open server weekend from April 18 to 20, and now that the 18th has finally been reached we are pleased to announce that the event has begun on time. You can download a copy of the game here, and don't worry about login issues; apparently the team has resolved those so we probably won't have more horror stories of people literally waiting for several hours to get in. If you aren't able to play this weekend for whatever reason, I'd suggest downloading the client anyways since Tux3 will probably release another private server for it after the event is done. We've also copypasted a guide to the game below, which you can also find at http://forum.legendsofequestria.com/index.php?topic=10677. Apparently punting small animals off into the distance is all the rage these days, as the newest Horse Game video seems to focus almost exclusively on this cruel (yet totally hilarious) activity. There's also a rather nice sword and a WIP map which will probably look much more impressive in the near future once some more work has been done on it, although that's probably not their main priority right now. Oh yeah, and the team's lead developer occasionally posts small updates on his Twitter account, which you can follow @SprakleDev. Today marks the release of Nightfall's fifth beta, along with all the new features and balance adjustments that such an update usually entails. So if you've already finished My Little Investigations (or haven't gotten around to playing it, like yours truly) and have some spare time, you might as well give this a spin and see if the changes are for the better or not, since apparently the game is getting fairly close to leaving beta and will be considered stable once it does so. 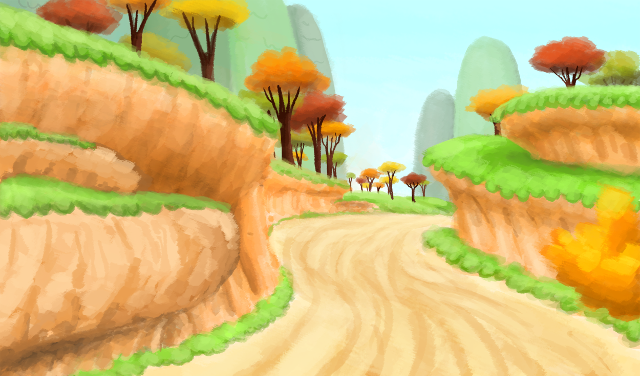 After a long time in development, with almost no word on progress from the team until recently, Equestrian Dreamers finally released the first case in their point-and-click adventure game, My Little Investigations, titled True Blue Scootaloo. While the game has received its fair share of attention and hype, does the first substantial fruit of the team's labor live up to expectations? Well, that's what this post is for. Check out some rambling opinions on the game across the break. Note: This review contains spoilers for the case. Read on with caution if you want to experience the game blind. That's right. After almost three years in development, My Little Investigations - the fandom's premier Phoenix Wright-inspired adventure game, from Equestrian Dreamers - has finally released its first case, True Blue Scootaloo. They also have the soundtrack, as well as the source code for both the current version and the previous Java-based version, available for download. In case you read the comments of our last post, you'd have heard that Dark Skyes' artist Pukey Pony got together with several folks and began work on an actual visual novel based off of the ill-fated trolling attempt (albeit without the supposed "deep RPG elements" and "100+ hours of gameplay"). As of now they're using placeholder music and backgrounds until more progress is made on the writing and character artwork, but I guess that isn't a really big deal since the fandom does have an overall lack of complete dating sims and it'd be nice to have that particular genre covered. There was a video update before this one, but Sam Hyde had it taken down from YouTube over "copyright violations" or some crap like that. As his previous efforts have shown us, Vanni is determined to redefine the way we see RPGs, and to accomplish his vision he has even gone so far as to program it from scratch in C instead of going about the usual route of whipping up crap in RPG Maker like a mere commoner. This may prove he's no scrub, sure, but even the best of developers can slip up sometimes, so is this an example of such? Pony fans will definitely want to check this one out, so read on below the break for my thoughts on it. Ever the ambitious fellow, Vanni decided to release a tie-in game to the ever-popular Goat Simulator (also being released today) featuring Rarity's waifu as its main character, doing what he normally does when he isn't being showered with affection from Maud. Some may find the content a bit lacking, although I personally think that it's an excellent representation of Tom's daily life including the bits where he does his own stunts and attends all the award ceremonies his voice actor has been been invited to lately. I'd suggest that future releases add in a realtime day/night cycle and possibly some wildlife to occasionally appear in the background, but as its stands right now this is probably one of the better avant-garde fangames we'll see this year (with the possible exception of BFS, which I'll be posting about in a bit). Rumour has it that a sequel is coming to the App Store featuring unlockable outfits. Look for it in Summer 2014! 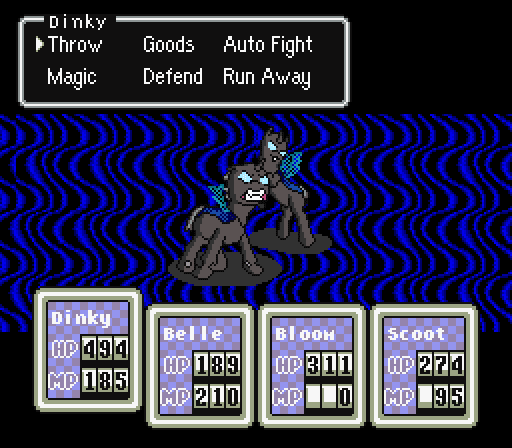 Given the current popularity of both Earthbound and My Little Pony, it was inevitable that eventually someone would mod ponies into the former, and now the deed has finally been done. I'm not sure about the mod's quality, but at least it should give you folks something to play while you wait for Curse of the Lost Kingdom's first part to be released on April 30th. So sit back, patch your Earthbound ROM and enjoy the ride! With the popularity of the Phoenix Wright series (and the availability of case creators based on the games), it's no surprise that we've seen quite a few projects centered on combining the concept with My Little Pony. Among those is this little gem from Zoo977. 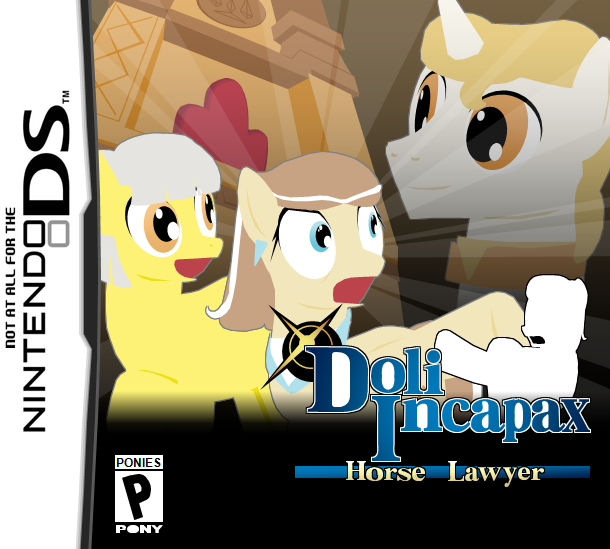 Doli Incapax: Horse Lawyer is a charming one-case game made with one of the countless case creators, and like any good game of its type, the writing is top-notch. It's a game filled with OCs (in fact, outside of a small role from Rarity, no official ponies appear in the whole thing), but the characters are explored in a depth that rivals the games Horse Lawyer draws its inspiration from, and the game itself is equally enthralling. I'll probably be getting into a more in-depth review later when I have the time, but there's another story-centric game sitting in the submission box, as well as a few personal projects of mine to get to, so you'll have to take my word for it that the game is definitely worth the couple of hours of entertainment it gives you. Surprisingly enough, Super Smash Ponies appears to be still alive and its developers are apparently looking for some people to help them finish Rainbow Dash so they can move on to the better ponies. Not all that exciting, but eh. It's a slow month, so if you happen to be one of those rare voice actresses or animators who aren't always busy with stuff (I'm looking at you, Nicoboss) perhaps you should consider checking this out. You could read the original announcement at their site, or just head on below the break for some copypasta. Considering what's plastered across her flanks, putting Pinkie Pie in a game about balloons seems like a no-brainer. This game from Brian Bullock (which is listed as a beta, despite feeling quite complete) is basically a clone of the NES's Balloon Trip, but with ponies and an online scoreboard. The latter does wonders for replayability of the game, even if the mechanics of lower scores on a name overriding older, higher scores is a bit irritating. Regardless, the game is well-built for a clone game, and like the original, is a fantastic way to spend a few moments if you don't mind dying a lot. 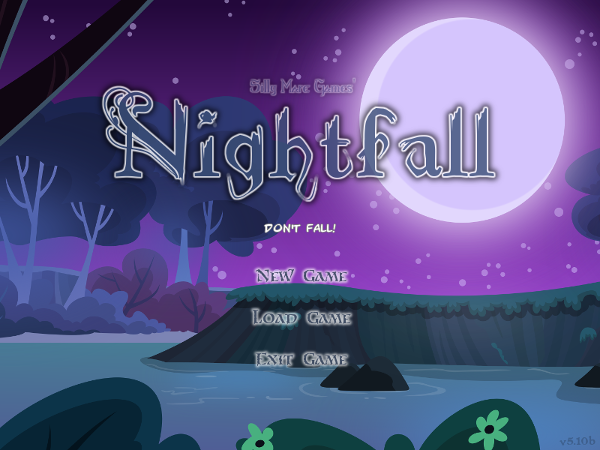 Some might question why the pony fandom needs yet another 2D platformer when it already has a truckload of them, but this one has an art style reminiscent of the more recent Rayman games and features Discord as its protagonist, a rather intriguing decision to say the least. Hopefully it manages to meet its projected release date of "somewhere in 2014" and isn't just a glorified "scroll past pretty backgrounds" program with minimal gameplay, but eh. The fandom's pulled off some pretty ridiculous things in the past, so why not this? In case you're wondering why this post is a couple hours late, let's just say that I was somewhat distracted by one Fluffy Wolf Vinyl. The open server weekends for Legends of Equestria are fun and all, but have you ever wished they came around just a bit more often? If so, you're in luck; the development team has just announced another one, only a few months after the last. This time, it corresponds with their appearance at BABSCon, running from April 18th to the 20th. 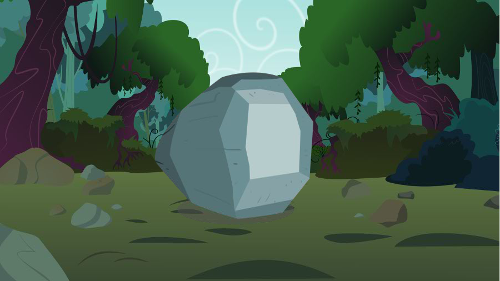 That leaves you with just over a month to get ready for the weekend of getting hopelessly lost in the Everfree Evershade Forest or whatever you play this game to do. Logging in will hopefully be much easier this time, since they fixed an issue relating to that toward the end of the previous open server weekend. See you guys there! 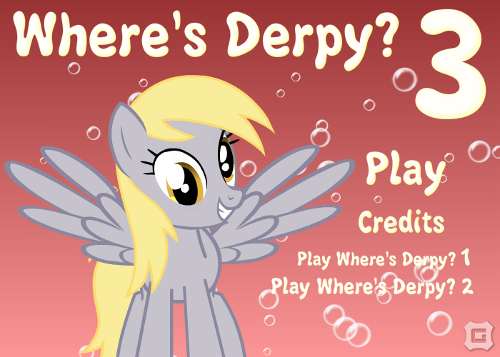 Effectively a gamification of the fandom's favourite pastime (aside from participating in drama), Where's Derpy? 3's title practically explains itself, and in an entirely unsurprising manner it's pretty much exactly the same as its predecessors except with new screenshots to examine. Not that this is a bad thing, of course: there isn't really much that one could add to the formula anyways aside from recreating each scene from scratch in Flash and animating it (which would probably make things even more difficult). Ladies and gentlemen, I present to you the next Fighting is Magic™. 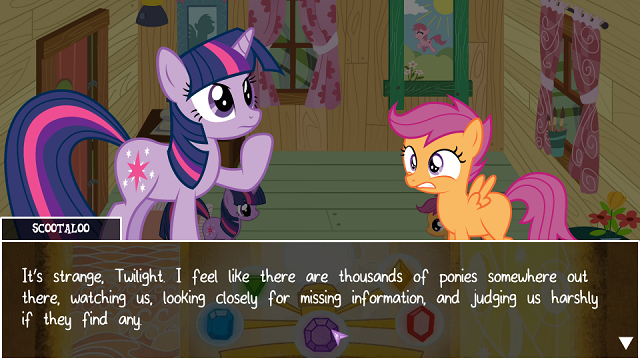 The pony fangaming scene has a good share of games inspired by particular episodes. Stop the Bats! is one of them, created by Versimer in a mere 8 days using C++ and the SFML library. That's fairly impressive in itself, considering that some fangames use premade engines and still take longer to complete. But just how good is the game itself? Well, you're gonna have to hit the page break to find out. I've been waiting for an opportunity to give Ponykart's unofficial revival project some more exposure for a while now, and now the time has finally come. You see, they're looking for some C++ programmers who also have some experience in C# to help them with the port, along with the usual graphics designers, musicians, and even writers (although I still have no idea why a kart racer would need people dedicated to the latter, especially since characters in said games rarely speak). Interested? Check out their announcement for details on the requirements and how to submit an application, or just read the copypasted version below the break. You might also want to check out their Google Group and GitHub repo. Coming in to fill another spot in the "pony games comprised entirely of OCs" lineup (which seems to be getting distressingly popular as of late) is a project by the name of Adventures in Equica: Unicorn Quest. 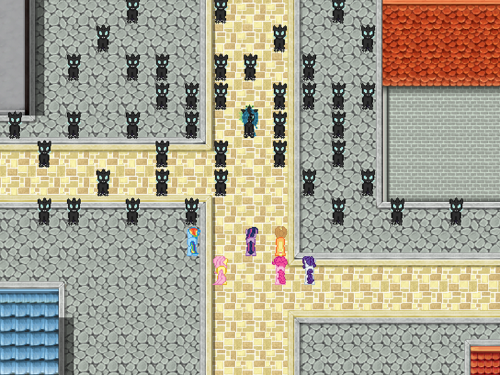 The developer, Yotes Games, describes the project as an action-RPG, with a battle system reminiscent of top-down shooters and exploration similar to 2D Zelda titles. The game is still in the conceptual phase at the moment, unfortunately, but the developer promises daily updates for those of you who are interested in the development process. You can read more about the project, including the developer's long-winded explanations of various game concepts, in this post on his blog. Continuing the grand tradition of Nightfall beta releases being uploaded at the appropriate time comes its fourth beta, with some lovely new additions/improvements such as an Adventure mode, more skills, and various much-needed performance fixes. That's right, you can finally run Nightfall at a fairly decent speed in Wine (although you probably won't be able to run the game at faster speeds, since that is done by increasing the framerate). For convenience's sake, I've pasted the changelog below the break. Have fun with the new beta! It's been over a year since the last full Adventure of the Lunarbolts update, and as usual they showcase a couple scenes ostensibly about the developers creating this game, albeit while being portrayed as hopeless fools whose props repeatedly explode and are almost entirely unable to accomplish simple tasks. Perhaps there is no Adventure of the Lunarbolts game after all, but this is all an extended joke directed at overhyped projects created by bickering development teams? There's always the possibility that they'll end up not releasing the game at all, but a documentary of its developers having lunch. 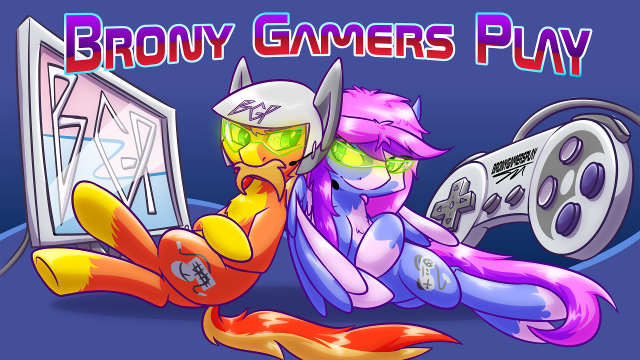 So a while back there were a bunch of people who got together to make Let's Play videos and called their channel Brony Gamers Play. Since February marks their second year of existence they've decided to hold a daily stream over at their Twitch channel and give out various prizes every day, which is pretty sweet if you're the type of person who doesn't mind watching other people play video games with the slight chance of winning something in return. To qualify for the giveaway you'll have to follow their Twitch channel at http://www.twitch.tv/bronygamersplay/ and talk to them on the chat. There's also a chart detailing as to exactly what games are being given away on each day, which may or may not interest you. This simple game from NzureuzInternational is a game about hopping on clouds and Shadowbolt heads to ascend into the sky. 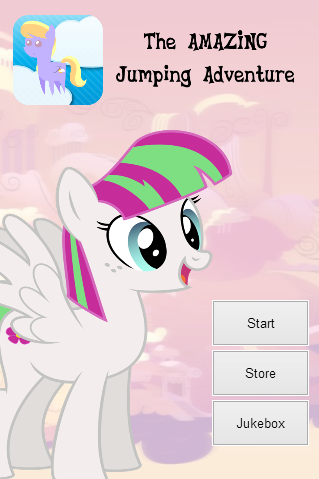 It's basically a ponified clone of Doodle Jump. There's an in-game store with a few things to purchase with your accumulated score, but the options are either aesthetic (a couple of extra characters that are just reskins of Cloud Kicker) or only useful for score attacking ("start at 650 feet" and "add 500 feet to the end score", both of which cost exactly as much as you get out of them). Whether or not you enjoy this will depend on whether or not you enjoy the original game it's based off of. The game also has Android and iOS downloads for taking on the go, if that's your thing. After playing around with Neverfree for a bit I've come to the conclusion that its creator must be quite the Cave Story fan, as this game's mechanics are highly reminiscent of the indie classic (yes, you can use the rapid-firing weapon as a makeshift jetpack). It could honestly make for a really great game if one were to expand upon it and add some more levels, maybe some more varied enemies/bosses that do more than just pace from one end of the room to the other as well. There was also a particularly crowded spot near the final boss that could lead to the player clipping through the wall if they were repeatedly jostled about by enemies, which one should be cautious of if one attempts to play this. Oh yeah, the game would really benefit from some music/sound effects. I was also quite pleased to see someone using LÖVE for once; it's probably my overall favourite 2D engine and it feels like there's never enough people who actually use it. 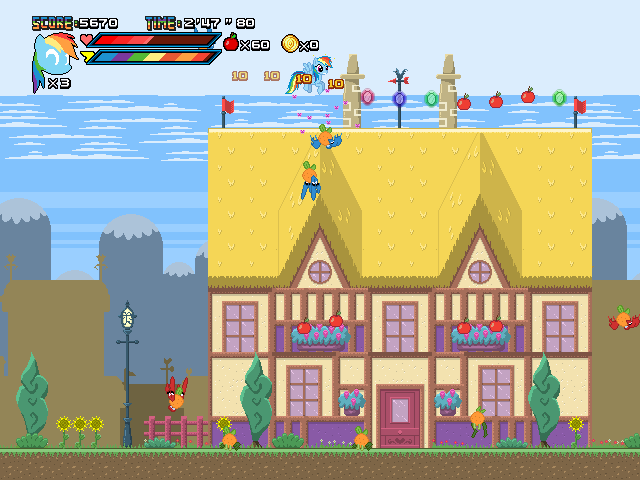 For a while now Horse Game's developer has been working on a brand new level, but as you can imagine it's made for quite the workload and he could really use some help getting his project off the ground. If it turns out fairly well he plans on turning this into a fully-fledged game, and that hopefully includes the possibility of online multiplayer (really, who hasn't played the demo and fantasized about playing it with their friends?). In case you don't want to visit the original Reddit post for some reason, we've pasted its contents below the break. 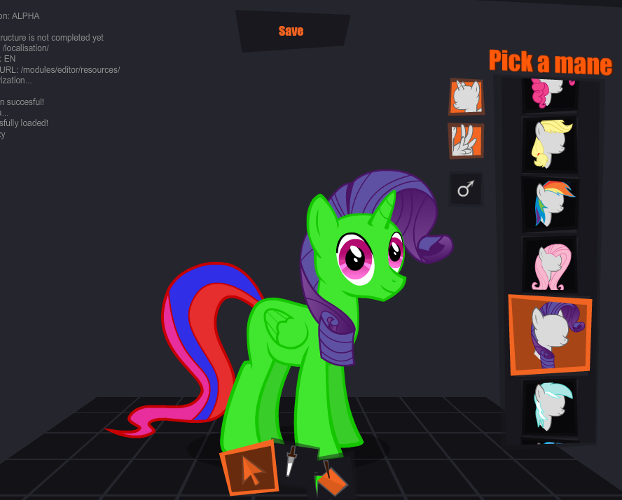 In January I wrote about Equestria Jukebox, the unusual pony creation utility/chat app successor to the Pony Avatar Creator, and its alpha client came out on this Monday. It looks pretty neat so far, although there's a distinct lack of manes and accessories for users to pick from and I was unable to save my abominations to the server, leading me to believe that they have gained sentience and are actively discriminating against ugly original characters. Do note that the userbase is fairly small at the moment, so if you do make a chat group it'll probably take quite a while to grow (unless the service undergoes a sudden growth in popularity). 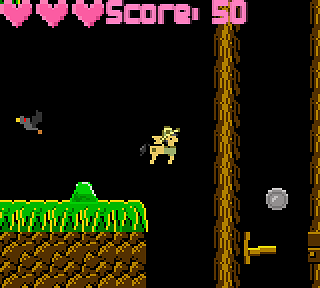 This game from Okamikurainya is a fairly standard pony platformer starring Daring Do (who would've guessed? ), with its fair share of barely-visible jumps and doodads floating around waiting to be collected. The lack of any temporary invincibility after a hit leads to many situations where one hit leads to more that can't be avoided. The boss is unusually clever for these kinds of fangames, though, and manages to be pretty fun when you're not getting backed into a wall and killed instantly. There's some potential for a fun game here if the developer works to add some variety to future levels. Coming from Penta Studios, of Waiting is Magic fame, TWALAGHT SPARKUHLZ REVEHNSHE 2 is the sequel to the first game about defending Ponyville from parasprites and other assorted creatures of the forest. The demo released for the MLGD competition contains an introductory sequence, three levels (allegedly; I keep messing up and dying halfway through the second) and five upgrades. Not a ton of content, but certainly enough to discuss a bit, yes? Last year there was some event called the Crystal Games Challenge, and unsurprisingly they're holding another one this year from June 13 to 15. That's really all I know, aside from their plans to feature the entries on a convention panel somewhere like they previously did at Everfree Northwest. From what I've seen, this is a fairly generic pony platformer with multiple characters and, surprisingly enough, local multiplayer (although I haven't really gotten the chance to try it out yet, as usual). Dunno if this'll go anywhere or not, but Hopeabandoner's other main fangame project looks much more promising so I'll be posting about it next. He also made this creepypasta named BENT.EXE, but I dunno if I'll ever get around to posting it.